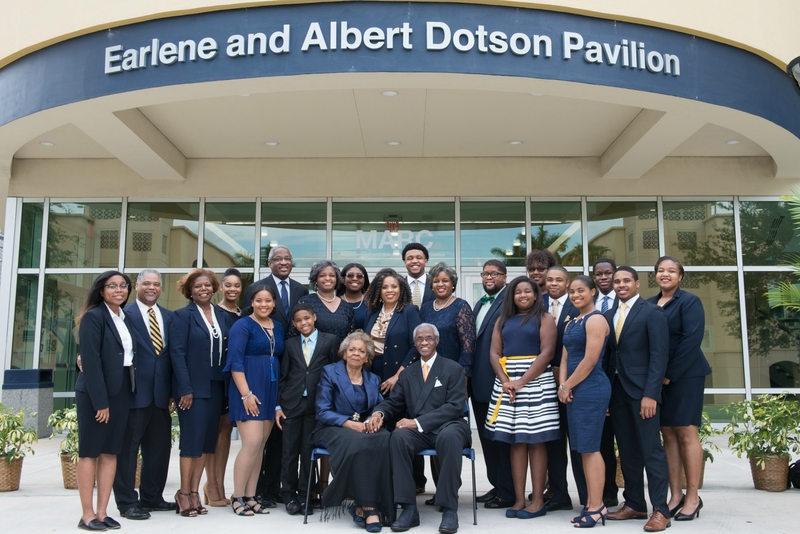 The family of FIU visionary Albert Dotson Sr. has donated $1 million to FIU to commemorate his legacy at the university. The gift supports athletics, scholarships for minority students, and the Management and Advanced Research Center (MARC building) at the Modesto A. Maidique Campus. In recognition of this gift, the university renamed the International Pavilion at the MARC building as the Earlene and Albert Dotson Pavilion, named for him and his wife. Dotson is a trustee emeritus and chaired the FIU Board of Trustees from 2009-2011. He also served on the FIU Foundation, Inc. Board of Directors from 1983-2001. Dotson played an integral role in the founding of FIU’s College of Law and Herbert Wertheim College of Medicine. A longtime supporter of athletics, he was among the advocates who saw a future for football at FIU and helped secure Riccardo Silva Stadium. As a trustee, Dotson served on the presidential search committees that appointed both President Modesto A. Maidique in 1986 and President Rosenberg in 2009. An engaged community leader, he has also served on the Greater Miami Chamber of Commerce Board of Directors. Dotson’s wife of 60 years and business partner, Earlene, who founded Puryear Inc., was by his side the whole time, attending FIU football games and devoting her time and service to FIU. “For more than three decades, he and Earlene have had dedication and unshakeable devotion to this institution,” Rosenberg said at the ceremony. All five of the Dotsons’ children and their spouses; all 13 grandchildren (some of whom came in the midst of their universities’ finals week); and close family and friends came to FIU, some from out-of-state, to celebrate. Earlene and daughter LaTéssa Hall cried happily as the curtain fell, revealing their family name on the front of the MARC building. Hall had visited FIU the week before to watch the name be affixed to the building. She even helped workers place some screws into the backs of the letters. At the unveiling ceremony, the Dotsons met football player Shawndarrius Phillips, a first-generation college student and the oldest of 12 raised by a single mother. Phillips is a sophomore majoring in communication arts and hopes to follow in Dotson Sr.’s footsteps by opening his own business. Phillips knows well the impact that supporters like the Dotsons have on FIU students. After tearing his ACL in 10th grade, he thought he would never play football again. But knowing the game may be his only route to college, he worked hard to recover in physical therapy, and eventually earned a full athletic scholarship to FIU. “I want to thank you both for what you’ve done for FIU, what you’ve done for FIU Athletics and what you’ve done for students like me,” Phillips told the Dotsons. The Dotsons also got to meet Jenna Bilodeau, a third-year student in the Herbert Wertheim College of Medicine. She was inspired to pursue neurology after her father suffered a brain injury in 2015 and she helped nurse him back to health. When she visited FIU to interview for the program, she knew it was the right choice. “I turned to FIU, because FIU felt like home,” Bilodeau said, thanking Dotson Sr. for his role in bringing the college to FIU. Darlene D. Harris, VANAP Program, FIU school of Nursing. Congratulations to one of the generous and Loving families I know. Welcome to the FIU Family. “To whom much is given, much is required. And it’s what you do for others that will last.” Totally true. It feels great to be able give back to others what you receive yourself.